This is a repost that originally appeared on the Couchbase Blog: Chatbot on Azure and Couchbase for Viber. A chatbot can be a novel way to interact with users. After writing a post introducing the basics of serverless, and also writing a post on writing Azure Functions, I decided I would try to build something a little more practical than a "hello, world". Using a serverless architecture for a chatbot makes sense. Chatbot usage may be sporadic. Usage may peak and drop at various times of the day. By using serverless, you’ll only be paying for the resources and time that you need. If you want to follow along, all the source code for this blog post is available on Github. I could have chosen a lot of different platforms to create a chatbot for: Facebook Messenger, Skype, WhatsApp, and more. But I decided to go with Viber. In the United States, Viber doesn’t seem to have a huge following, but I’ve been using it a lot. It’s a very handy way to chat with my wife, send pictures, funny GIFs, and so on. I find it to be more reliable and faster than SMS, especially for pictures. I wish everyone in my family was using it! It’s also a nice side effect that Viber is a Couchbase customer. They switched from MongoDb to support their growing data needs. Also, Viber’s REST API is simple and well documented. Between the use of serverless architecture and Viber’s API, I couldn’t believe how fast I went from 0 to chatbot. First, You’ll need to start by creating a bot in Viber (you’ll need a Viber account at some point). Viber will give you an API key that looks something like 30a6470a1c67d66f-4207550bd0f024fa-c4cacb89afc04094. You’ll use this in the HTTP headers to authenticate to the Viber API. Next, create a new Azure Functions solution. I’ve previously blogged about Azure Functions with a followup on Lazy Initialization. I decided to use C# to write my Azure Functions. Unfortunately, there is no .NET SDK for Viber (as far as I know), so I’ll have to use the REST API directly. Not a big deal, I just used RestSharp. But if you prefer NodeJS or Python, Viber has got you covered with SDKs for those languages. Before you start coding, you’ll need to setup a Webhook. This is simply a way of telling Viber where to send incoming messages. You’ll only need to do this at the beginning. I did this by first deploying a barebones Azure Function that returns a 200. 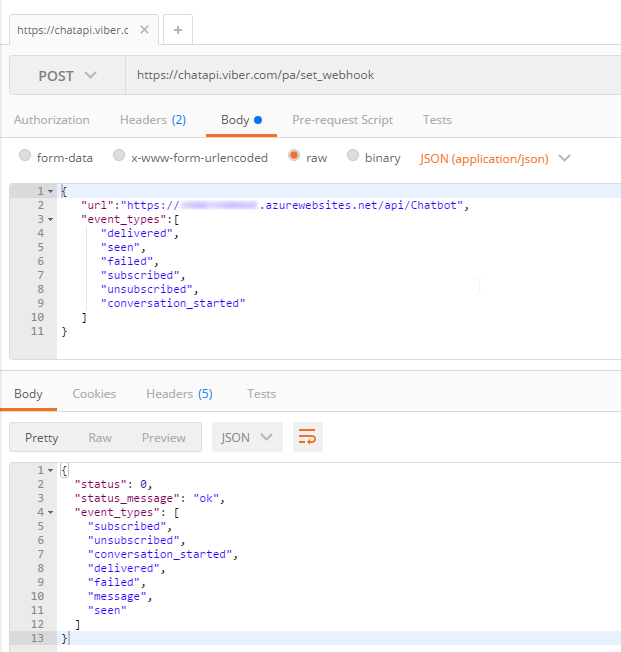 I used Postman to set the initial webhook. Finally, I setup a Couchbase cluster on Azure. Getting started with Couchbase and Azure is easy and free. (You can even use the "Test Drive" button to get 3 hours of Couchbase Server without expending any Azure credit). I created a single user called "viberchatbot", a bucket called "ViberChatBot", and I loaded the "travel-sample" bucket. If I say "hi" (or hello, etc), it will respond with "Howdy!" If I ask for "metrics", it will tell me how many messages it’s processed so far. If I mention "twitter", it will make a recommendation about who to follow. If I ask for flights from CMH to ATL (or other airports) it will tell me how many flights there are today (I will use the travel-sample bucket for this data). If I say "help", it will give me a list of the above commands. I decided not to use any natural language processing or parsing libraries. I’m just going to use simple if/else statements and some basic string matching. If you are planning to create a robust chatbot with rich capabilities, I definitely recommend checking out libraries and tools like LUIS, wit.ai, NLTK and others. I started by creating a few C# classes to represent the structure of the data that Viber will be sending to my serverless endpoint. This is not an exhaustive representation of Viber’s capabilities by far, but it’s enough to start receiving basic text messages. Next, the Azure function will convert the raw HTTP request into a ViberIncoming object. After this, I created a ViberProcessor class with a Process method that receives this object. LogIncoming creates a record (in Couchbase) so that I know everything about each request that comes in. // if the message contains "hi", "hello", etc say "howdy"
One of things my chatbot listens for is "metrics". When you ask it for metrics, it will give you a count of the incoming messages that it’s processed. Since I’m logging every request to Couchbase, querying for metrics is easily done with a N1QL query. Note that I’m also logging each response from Viber to Couchbase. This could be very useful information for later analysis and/or troubleshooting. If Viber decides to change the structure and content of their response, the data in Couchbase is all stored as flexible JSON data. You will not get surprise errors or missing data at this ingestion point. That’s all the basics. Check out the source code for the complete set of actions/operations that the chatbot can do. To test out the bot, I used my Viber app for Android on my phone (and my wife’s, to make sure it worked when I went public). Beware: by the time you read this, the chatbot I created will likely be taken offline. 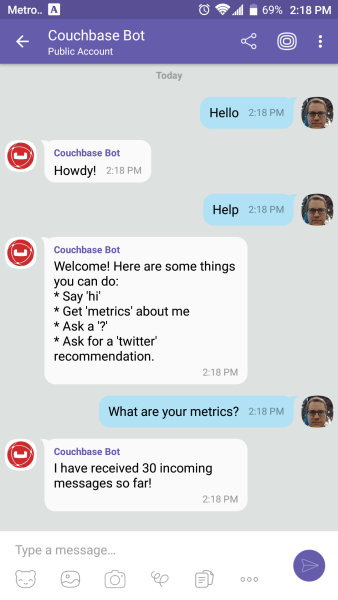 Anyone else who creates a "Couchbase Bot" is not me! The serverless approach is a good way to control costs of a chatbot. Whether it’s Viber or some other messaging platform, there is potential for sporadic and cyclic use. Viber’s REST API utilizes JSON, which makes Couchbase a natural fit for tracking/storing/querying. Couchbase’s ease of scaling and partnerships with Microsoft (and Amazon and Google) make it a great choice for a chatbot backend. This was really fun, and I could definitely get carried away playing with this new chatbot. It could analyze images, tell jokes, look up all kinds of information, sell products and services, or any number of useful operations. I would love to hear what you’re doing with chatbots! Please leave a comment or contact me on Twitter @mgroves.